Republican presidential candidate Dr. Ben Carson has been under a lot of scrutiny recently for a number of questionable statements he’s made, past and present. One has concerned the Egyptian pyramids, which Carson believes were constructed by the Old Testament patriarch, Joseph, to store grain. Coming into English via French and Latin, the ultimate base of English’s pyramid is the Greek πυραμίς (puramis), which named the Egyptian funerary monuments we still marvel at millennia later. This Greek word came to name other structures of pyramidal shape, a sense development also observed in Latin (pȳramis) and French (pyramide). The stem of the Greek noun was πυραμίδ- (puramid-), which is ultimately why the English word features a d.
As far as the Oxford English Dictionary (OED) can tell, pyramid reached English as early as 1398, when, appearing in the late Latin form of piramis, it first referred to pyramids in the context of geometry. 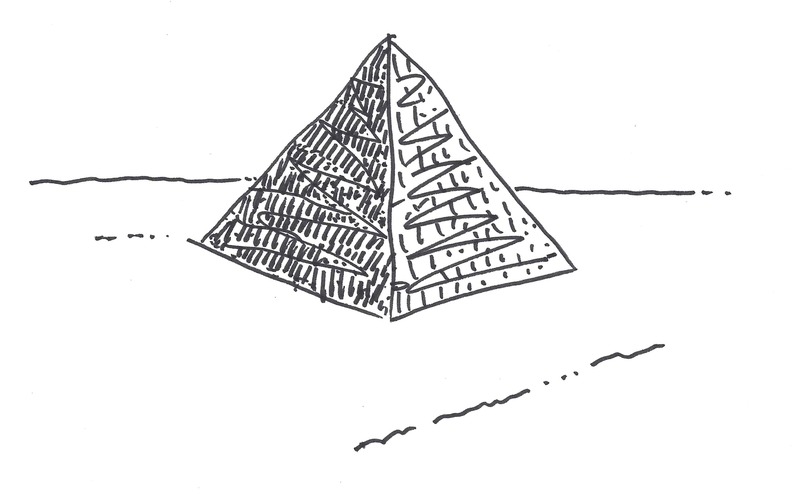 The word doesn’t explicitly refer to the Egyptian structures until the 1500s, at least according to the OED’s account. So, how did the Greeks construct their word for pyramid? This question has sent many digging, including even the scholars of antiquity themselves. Some have suggested the Greek puramis derives from πῦρ (pur), “fire,” due to the shape of the structure’s apex. Others have proposed a root in a similar word, πυραμίς (puramis), a kind of “cake,” whose shape resembled pyramids, apparently. Now, this puramis is derived from πυρός, (puros), meaning “wheat” or “grain.” Other efforts have broken this puramis down to Greek words for “to measure grain” or “to collect grain.” Could the word even be connected to a Semitic root for “hill” or “fruit measure,” as has been speculated? Other etymologies excavate in situ, linguistically speaking: Egyptian roots. One explanation claims the word is from the ancient Egyptian for “ray of the sun,” referring to the pyramid’s kin, the obelisk. Another, more common explanation posits an origin in the Egyptian piramus, among other forms, claimed to mean the “slant height” of the structure.